The OMG-PCI-DIO series provide 32, 48, and 96 channels of buffered digital I/O emulating 8255s for industrial control applications. 10K pull up resistors are included on each port bit. Each board contains 8 bit I/O ports configurable as inputs or outputs. This gives the user the ability to customize the combination inputs or outputs as needed. In addition, the low order bit of the first port can be set to generate an interrupt for status monitoring applications. A special factory configurable interrupt feature allows the user to request conditional I/O combinations for interrupt generation. When the I/O combinations occurs, a hardware interrupt is triggered. 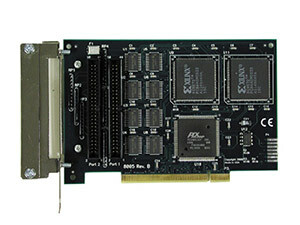 The OMG-PCI-DIO includes drivers, utilities, and programming samples for Windows 98/ME/NT/2000/XP and Linux to aid in the development of reliable applications for the OMG-PCI-DIO family of digital I/O boards. All of the I/O signals are accessed through a standard 50-pin connector. The 32-channel boards contain one connector, the 48 channel board contains two connectors and the 96-channel board has four connectors. OMEGA provides an optional OMG-TB07 terminal panel for wiring to the I/O connector. One terminal panel is required for each I/O connector. An OMG-CA167 is also needed for each terminal panel. The I/O connector is also compatible with industry standard relay racks. A OMG-CA135 cable can be used to connect each I/O connector to a relay rack. Connectors: 50 Pin IDC with cable lock. The OMG-PCI-DIO32 have one connector, the OMG-PCI-DIO48 has two connectors, and the OMG-PCI-DIO96 has four connectors.